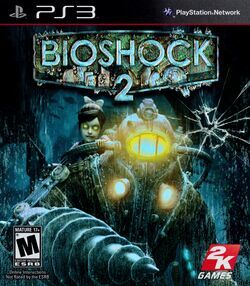 BioShock 2 is a first-person shooter video game developed by 2K Marin and Irrational Games for the Xbox 360, PlayStation 3 and Windows. It is the sequel to the critically acclaimed 2007 video game BioShock. The game was released world-wide on February 9, 2010. The game is set in fictional dystopian city Rapture, in a steampunk alternative history 1968, eight years after the events of BioShock. The protagonist and player-controlled character is a Big Daddy, a being that has had its organs and skin grafted into an atmospheric diving suit. Among the first of its kind, the player-controlled Big Daddy reactivates with no recollection of the past decade's events, and scours the city in an attempt to relocate the Little Sister that he was paired with. When it becomes obvious that Rapture's leader Sofia Lamb will become responsible for the city's destruction, the Big Daddy attempts to overthrow Lamb and her army of Big Sisters. This page was last edited on 2 December 2018, at 17:53.